"At first, it must have looked so easy. Within nanoseconds of Steve Jobs' January 2010 unveiling of the iPad, a gaggle of companies decided to get into the tablet business." After one and three quarter years, there is still no real challenger to the iPad, although many have tried (and some have already failed and/or bailed), and many are still trying. The current status: Android, while a runaway success on phones, still isn't able to duplicate that success on tablets - maybe Ice Cream Sandwich will be a game changer; HP's WebOS, so long, we hardly knew ye; RIM's (PlayBook) QNX is battling to keep from ending-up last, despite the advantages of a solid OS without app support; Windows, with Windows 8 still pretty far away, is an unknown quantity at this point, but can't be overlooked. 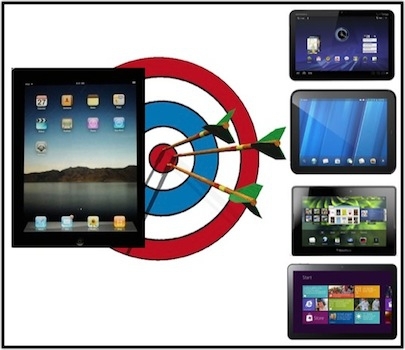 So, the iPad still rules the roost, at least in CNET's view. Anyone think that Amazon can be a serious competitor if they choose to enter the fray?